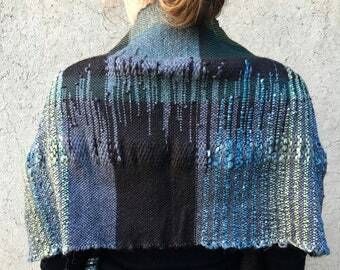 Announcement I have been really enjoying working across a wider space to create dynamic patterns for shoulder warming wraps and shawls, which can be styled in different ways with the use of a shawl pin. 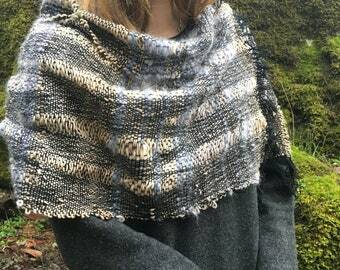 I have been really enjoying working across a wider space to create dynamic patterns for shoulder warming wraps and shawls, which can be styled in different ways with the use of a shawl pin. 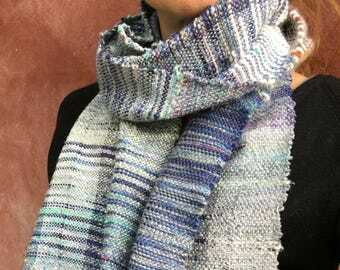 This is a lovely scarf. The colors are brighter and more varied than they appeared on screen. 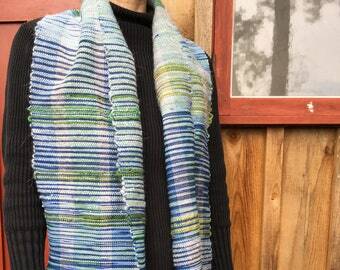 It is lightweight but warm and wraps well. Delivery was fine despite Canada Post strike. Very pleased with quality of item and service, Thank You! 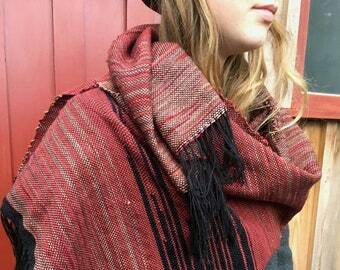 The quality of these scarves is amazing!! Colors were true to pictures too, which is always a bit of a gamble when purchasing online! 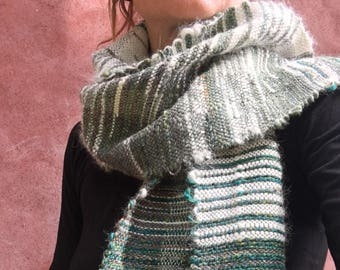 I was looking for a table runner for a Christmas gift and ended up buying this scarf when I stumbled upon this page on Etsy - the patterns are absolutely beautiful and can be used for multiple purposes, so keep that in mind when perusing the website. The seller is incredibly responsive to my questions and processed my shipping timely. I’d highly recommend this seller and their products to anyone!! Spinning and weaving with fibre from my own angora rabbits. Rosey, one of my french angora rabbits. 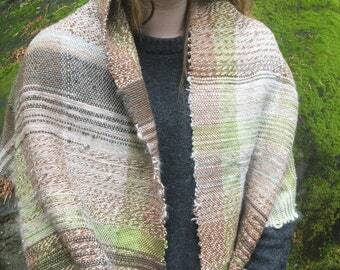 Saori weaving on an island on Canada's west coast. 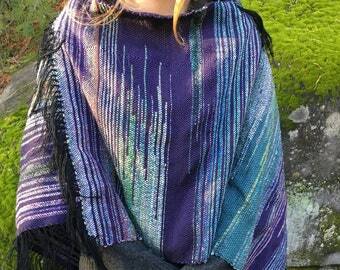 It is often called freedom weaving, or self-discovery through free weaving. 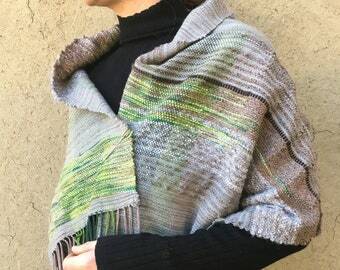 I have discovered for myself the meditative zone that comes from being immersed in colour and texture, and the ongoing experiments that result from such combinations. There is no wrong way, no mistakes, only un-intended natural beauty that no machine could duplicate. Judgements are moved aside and replaced with curiosity and kindness. I hope you enjoy what you see, and if you acquire something, I hope it feels just as beautiful in your hands as it does in mine. Recently I have acquired three french angora rabbits, and am currently learning to incorporate their amazingly soft fibres into my creations. 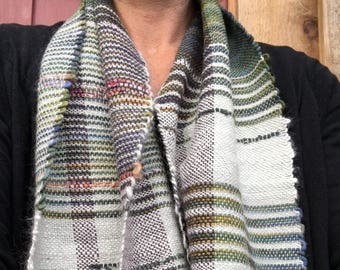 I began weaving soon after my husband and I completed the building of our straw bale house in the Gulf Islands of BC in 2013. 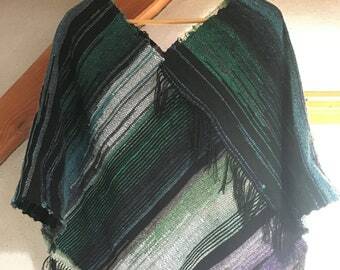 I discovered Saori weaving, and have grown to love the tranquil, creative, and endless expressions of Saori.